ets for the Africa Cup of Nations so that the poor can attend matches, and called on the wealthy to do likewise. “We must give solemnity to this CAN event, we have to buy tickets to fill stadiums,” the head of state said. “Let those who have the means help the poor! Myself, I bought 40,000 tickets at a rate of 10,000 per region (four sites are hosting the event). These tickets cost 500 FCFA (75 cents) which amounts to 20 million CFA francs (30,000 euros),” president Nguema told national television on Monday during a meeting with village leaders and military and civilian authorities. 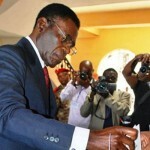 Oil-rich Equatorial Guinea has been ruled with an iron fist by President Nguema, 72, since he seized power by coup d`etat in 1979. The head of state added that stadiums needed to be full to bring money into state coffers after Equatorial Guinea stepped in to host the event in place of Morocco. To encourage people to attend matches the working day for civil servants has been cut by two hours on match days. Meanwhile, neighbouring Gabon, who co-hosted the continental tournament with Equatorial Guinea in 2012, on Monday delivered 20 buses which will be used by the teams during the event which gets underway on Saturday. “This is our contribution to support Equatorial Guinea. We have a saying that when your neighbours are having a party the entire village is celebrating,” said Gabonese sports minister Blaise Louembe of the free loan of buses.